Boeing had questioned whether Airbus would really assemble the former Bombardier jet in the US. Airbus is now getting that underway, though it’s moving slowly on the planned production ramp-up. Airbus has broken ground for a new factory in Mobile, Alabama, defying predictions by archrival Boeing that the plant would never be built. By midyear, mechanics will begin assembling the first American-made A220, a single-aisle jetliner developed by Bombardier and taken over by Airbus last year. Delivery of the initial plane with a made-in-the-U. S. A. label is scheduled for next year. The new factory caps a dizzying turnaround for the Canadian-designed aircraft formerly known as the CSeries, which Airbus rescued in 2018 after working for years to stymie sales of the 100- to 150-seat jets. Bombardier turned to the European plane maker after Boeing rejected overtures. The U.S. aerospace giant then waged a high-profile and ultimately unsuccessful campaign to slap duties on imports of the jets by Delta Air Lines. “That plane with our Airbus brand, with our support, our procurement and our sales is a game-changer,” said Jeff Knittel, Airbus’ Americas chief. But it won’t be until the middle of next decade that Airbus reaches the peak production target of 14 jets a month, shared across two factories: four a month at the plant in Mobile, Alabama, and 10 at the original assembly line in Mirabel, Quebec. That’s a slower ramp-up than Bombardier envisioned in late 2017, when it said Mirabel would deliver as many as 10 of the planes a month in 2020. Building a new factory would “make no economic sense,” Boeing said, contending there were too few orders to support a second production facility beyond the existing one in Mirabel, Quebec. Airbus has been shoring up sales and production of the jetliner since taking control over the unprofitable CSeries program July 1. The economic case once questioned by Boeing has grown stronger after a flurry of recent deals expanded the backlog of unfilled A220 orders to 480 aircraft. The initial sales and a top-up order by Delta show that there is ample demand to support a second factory in Mobile, Knittel said. Airbus is in discussions with several U.S. customers, he said, declining to provide specifics. 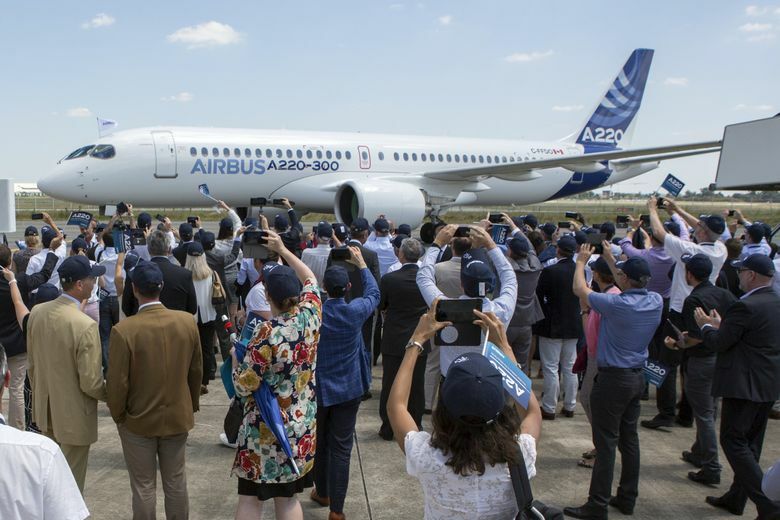 Final assembly of the A220 jets in the U.S. “is a vital selling point for most U.S.-based customers,” Airbus said by email. Even so, Airbus and Bombardier plan to build the first 40 A220s ordered by Delta in Mirabel. The desired savings likely represent about $3 million per plane, according to Benoit Poirier, an analyst at Desjardins Capital Markets. In a twist, the new Airbus factory will be modeled on the production system that Bombardier created in Mirabel rather than mimic a neighboring A320 plant in Mobile, said Florent Massou, head of the A220 program. That’s unexpected, given the mass-production techniques that Airbus and Boeing have forged as they push single-aisle jet output to record-high levels. When Boeing took control of McDonnell Douglas’ MD-95 program after the companies’ 1997 merger, for example, engineers created an elaborate cable system to move jets and copy the moving line created for the 737 program. The jigs, tooling and robotics at Mirabel are all cutting-edge, part of a lean production system that will eventually make 10 of the aircraft a month. But the engineers’ desks scattered around the factory floor hint at the problem-solving needed to triple output by the mid-2020s. “Technically, the production processes haven’t changed,” Massou told reporters at Mirabel last week. Rather than changing out equipment, Toulouse, France-based Airbus has focused on how work is organized to make sure that unfinished tasks aren’t handed over to workers downstream, while training mechanics to be more efficient. The Alabama final assembly line will look “exactly like this,” Massou said Jan. 14, from a balcony overlooking the Mirabel factory floor, where two lines of A220s were slowly taking shape. That’s so that workers at the two factories can share the tribal knowledge that comes with repeating tasks — the learnings that drive down cost and speed production times for aircraft, he said. Including the new factory, Airbus’ total investment in Mobile will approach $1 billion, Knittel said. Bombardier has committed to providing as much as $700 million in funding to the A220 partnership through 2021, Chief Financial Officer John Di Bert said last month. The figure includes a commitment of $350 million for 2019. Airbus and its partners are investing $300 million in the Mobile facility against the background of uncertain economic fallout from Brexit, and the emerging competitive threat of a joint venture that will give Boeing control of rival aircraft made by Brazil’s Embraer. Editor’s note: A comment thread was erroneously attached to this story when it was first published. It has since been removed, in accordance with our policies regarding stories from wire services.